The submarine Kavachi volcano in the Solomon Islands south of Gatokae and Vangunu islands is frequently active but rarely observed. Consistent activity was reported for more than 4 years between November 1999 and August 2003. An 8-month period of quiet was broken with another explosive eruption above the ocean surface on 15 March 2004 (BGVN 30:03). No observations of ongoing activity are known over the next two years, though eruptions may have continued. Satellite imagery using the Advanced Spaceborne Thermal Emission and Reflection Radiometer (ASTER) during 2006-2016 frequently revealed evidence of activity, on at least 35 days, using the Visible Near Infrared (VNIR) bands. Very little ASTER imagery is available for Kavachi during 2001-2005. ASTER images on 27 February and 24 March 2006 (figure 13) show renewed activity. Vigorous upwelling along with turbulent ash-laden water and a sulfur odor was witnessed on 6 April 2007 (BGVN 32:07). An ASTER image on 15 June 2007 (figure 14) showed pulses of discolored water originating from the vent, confirming ongoing activity. A small area of discolored water was next seen in satellite imagery on 12 December 2007. A small plume of discolored water appeared in ASTER imagery again on 26 February 2008. On 20 March 2008 the Landsat 7 Enhanced Thematic Mapper captured an image of an ash-and-steam eruption plume extending about 25 km NNE towards Gatokae (figure 15). The next satellite evidence of discolored water plumes were on 7 October 2008. Figure 13. ASTER VNIR satellite image showing a submarine plume of discolored water originating above the summit of Kavachi, 24 March 2006. There appears to be turbulence at the ocean surface and a possible line of pumice along the lower left edge of the discolored area. Courtesy NASA/METI/AIST/Japan Spacesystems, and U.S./Japan ASTER Science Team, ASTER via the Image Database for Volcanoes. Figure 14. ASTER VNIR satellite image showing a submarine plume of discolored water originating above the summit of Kavachi, 15 June 2007. Distinct pulses of activity, possibly individual explosions at the bright surface origin spot, can be identified based on the increasing diffusion of suspended particulates with distance from the source. Courtesy NASA/METI/AIST/Japan Spacesystems, and U.S./Japan ASTER Science Team, ASTER via the Image Database for Volcanoes. Figure 15. Satellite image showing an eruption plume from Kavachi on 20 March 2008 taken using the Enhanced Thematic Mapper on Landsat 7. Image modified using the "Percent Clip" option. Courtesy of USGS LandsatLook Viewer. An image on 11 November 2009 showed a larger very bright spot above the summit, possibly indicating turbulent activity at the ocean surface. Evidence of activity became more frequent in 2010, with imagery showing plumes on 15 February, 19 March, 23 June, 11 September, and 30 November. Submarine plumes continued to be visible often in ASTER images the following year, on 1 January, 13 March, 9 May, and 16 October 2011. 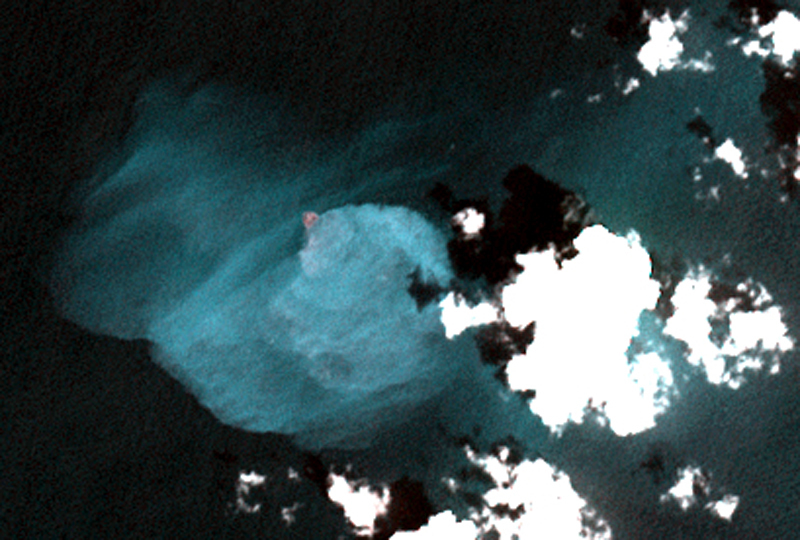 The next available satellite image with a discolored submarine plume from Kavachi was on 9 April 2012. Additional plumes were seen on 16 April, 3 June (figure 16), 31 August, and 26 November 2012. Figure 16. ASTER VNIR satellite image showing a submarine plume of discolored water originating above the summit of Kavachi, 3 June 2012. There appears to be a small island or area of persistent ash-laden surface turbulence at the source of the plume. Courtesy NASA/METI/AIST/Japan Spacesystems, and U.S./Japan ASTER Science Team, ASTER via the Image Database for Volcanoes. Intermittent satellite evidence of ongoing activity continued in 2013 with a discolored water plumes on 28 April, 15 June, 8 July, 25 August, 10 September, and 8 December. On 24 September 2013, Brennan Phillips of the University of Rhode Island passed within 2 km of the main peak onboard the M/Y Alucia but "did not see any visual eruptive activity on the surface." 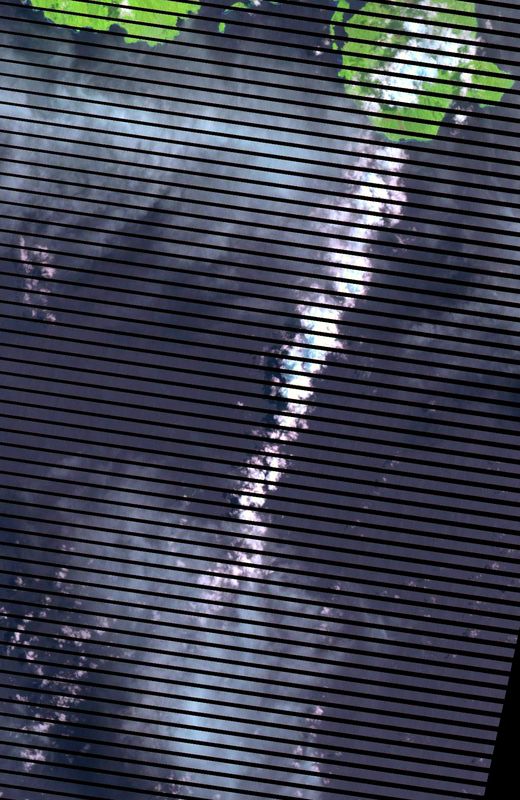 Although the imagery is not conclusive, many of the ASTER images after 3 June 2012 appeared to show a small island. On 9 January 2014 the ASTER imagery was much clearer, providing greater visual evidence that eruptive activity had built a small island from which discolored water plumes were emanating (figure 17). A few weeks later, on 29 January, the Earth Observing 1 (EO1) Advanced Land Imager (ALI) obtained an image of a submarine plume (BGVN 39:07) and turbulent source area similar to those seen in ASTER imagery. Additional activity was in evidence on 21 March and 8 May. Figure 17. 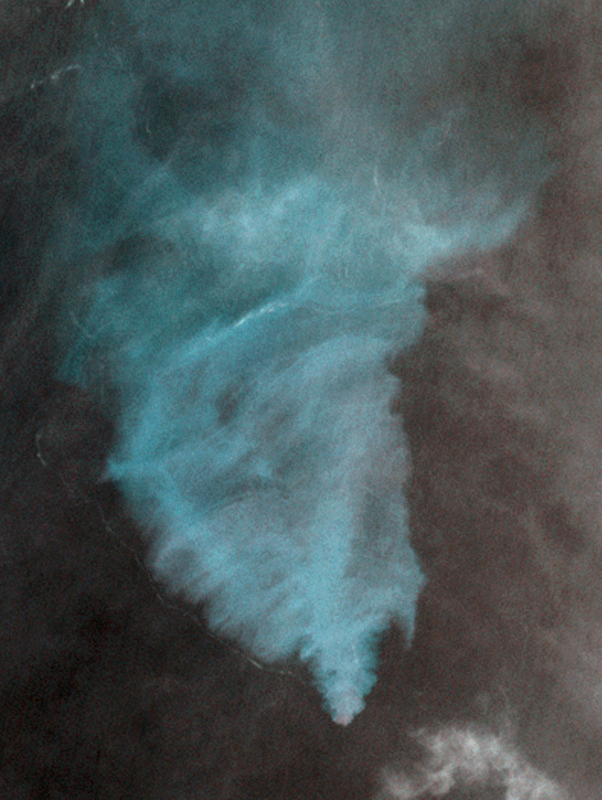 ASTER VNIR satellite image showing a submarine plume of discolored water originating above the summit of Kavachi, 9 January 2014. A distinct small island or area of persistent ash-laden surface turbulence can be readily identified at the source of the plume. Courtesy NASA/METI/AIST/Japan Spacesystems, and U.S./Japan ASTER Science Team, ASTER via the Image Database for Volcanoes. A cruise ship operated by EYOS Expeditions reported an eruption "at least four times" on 10 June 2014 (figure 18). The Expeditions' website noted that a staff member "spotted on the horizon discolored water and disturbances on the surface. As the vessel approached closer a few large plumes of water broke the surface about once every 10 minutes. Just before the ship left, however, [the] sea seemed to erupt and a massive plume of water and ash shot high into the air…." The island, or possibly an eruption exhibiting turbulence with abundant ash at the surface, appeared again on a 9 November 2014 image, and submarine plumes were evident in an 11 December 2014 image. Figure 18. Photo of an eruption sequence from Kavachi on 10 June 2014 taken from a cruise ship. Courtesy of EYOS Expeditions. An expedition for National Geographic in January 2015 took place during a rare lull in volcanic activity that enabled access to the volcano for mapping and sampling. B. Phillips reported that no eruptive activity was seen while at the summit location on 12-14 and 18 January 2015, but there was a large surface plume and lots of off-gassing from the crater rim; ASTER imagery confirmed a plume of discolored water on 12 January. Autonomous cameras deployed directly into the crater observed sharks, reef fish, and what appear to larvaceans (National Geographic, 2015). Satellite imagery showed discolored submarine plumes on 18 October 2015, but then not again until 26 August 2016. Eruptions were witnessed on a second visit by B. Phillips for National Geographic during 31 October-1 November 2016 (see National Geographic, 2017). Activity consisted of phreato-magmatic explosions approximately every 7 minutes that sent steam, ash, and incandescent tephra up to 50 m above the ocean surface. There was an occasional larger eruption roughly every hour. A remotely operated surface "drone" with a GoPro camera was right at the edge of the explosion but remained functional. Small lava particles stuck to the PVC hull of the vehicle itself were recovered and given to the Marine Geological Samples Laboratory (MGSL) of the Graduate School of Oceanography (GSO), University of Rhode Island." Bathymetric survey. A paper by Phillips and others (2016) following the January 2015 visit included medium-resolution bathymetry of the main peak (figure 19), along with benthic imagery, biological observations, petrological and geochemical analysis of samples from the crater rim, measurement of water temperature and gas flux over the summit, and descriptions of the hydrothermal plume structure. Based on the bathymetry, the summit was described by Phillips and others (2016) as being oblong with a pockmarked crater measuring approximately 75 x 120 m, and a rim rising to an average of 24 m depth. The deepest soundings on the peak were about 70 m and indicated asymmetrical terrain surrounded by almost uniform flanks with 18° slopes that descend to depths greater than 1,000 m. They confirmed the existence of a "southwest extension," or secondary summit rising to 260 m depth 1.3 km SW of the main summit. Figure 19. Bathymetry of Kavachi submarine volcano and the summit crater (inset, lower right). Red circles indicate locations of water column profiles and benthic imagery. White diamonds locate baited drop cameras deployments. The blue line delineates the path of a surface drifter that measured temperature and atmospheric CO2, The contour map and the inset at lower right were created from approximately 85,000 depth soundings visualized and edited as a three-dimensional point-cloud using IVS Fledermaus. The location map (upper right) was created with Generic Mapping Tools (v 4.5) using data available from Marine Geoscience Data System's Global Multi-Resolution Topography Data Synthesis (v 3.1). From Philips and others (2016). References: National Geographic, 2015, Sharks discovered inside underwater volcano (exclusive video) (URL: http://video.nationalgeographic.com/video/expedition-raw/150708-sciex-exraw-sharks-underwater-volcano; https://www.youtube.com/watch?v=0e3t18rrjOA). National Geographic, 2017, Robot vs. Volcano: "Sometimes It's Just Fun to Blow Stuff Up" (exclusive) (URL: http://video.nationalgeographic.com/video/expedition-raw/170419-sciex-exraw-robot-vs-volcano-sometimes-just-fun-to-blow-stuff-up; https://www.youtube.com/watch?v=Ca0zAAIVK3E). Phillips, B.T., Dunbabin, M., Henning, B., Howell, C., DeCiccio, A., Flinders, A., Kelley, K.A., Scott, J.J., Albert, S., Carey, S., Tsadok, R., and Grinham, A., 2016. 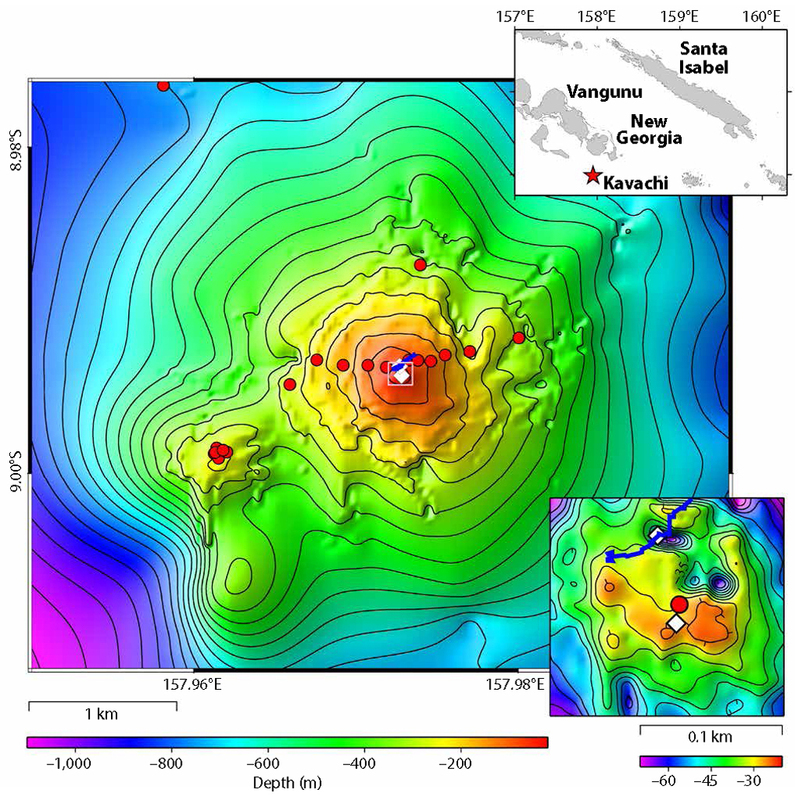 Exploring the "Sharkcano": Biogeochemical observations of the Kavachi submarine volcano (Solomon Islands), Oceanography v. 29(4), p. 160-169 (https://doi.org/10.5670/oceanog.2016.85). Information Contacts: EYOS Expeditions, Knox House, 16-18 Finch Rd, Douglas, Isle of Man, IM1 2PT (URL: http://www.eyos-expeditions.com/2014/07/kavachi-volcano/, https://my.yb.tl/eyosexpeditions/1604/); Brennan Phillips, Harvard University, Wyss Institute for Biologically Inspired Engineering, Wood Lab, 60 Oxford St., Cambridge, MA 02138 USA; Image Database for Volcanoes, Geological Survey of Japan, National Institute of Advanced Industrial Science and Technology (AIST) (URL: https://gbank.gsj.jp/vsidb/image/index-E.html, https://gbank.gsj.jp/vsidb/image/Kavachi/aster_p1.html); USGS LandsatLook Viewer (URL: https://landsatlook.usgs.gov/). Based on a report by an observer from The Wilderness Lodge, a news article indicated that Kavachi recently began to erupt after a long quiet period. An observer from The Wilderness Lodge reported that a 15-m-high island formed at Kavachi during an eruptive cycle 3 months prior to a visit on 16 November. By 16 November the summit had reduced to ~32 m below sea level. No evidence of volcanic activity was observed during the 3 previous months, which is the first time this has occurred in 4 years of observation. According to an observer at the Kavachi Wilderness Lodge, during October to November the top of Kavachi rose above sea surface, ultimately reaching 10 m a.s.l. The island that was produced was subsequently eroded by late-season southeasterly winds and swells. During visits to Kavachi in January, occasional explosive eruptions were seen that produced columns of steam, ash, rock, and water up to 1 km a.s.l. Sulfur slicks, small fragments of volcanic rock, and bubbles from the release of gas were visible at the sea surface. In addition, loud sounds were heard approximately every 2-15 minutes. The volcano's summit was estimated to be 60 m below sea level. During 27 November-13 December explosive eruptions occurred daily at Kavachi. During the next observation period (on 13 January), volcanic debris and gas bubbles were seen upwelling from the submarine volcano. The latter activity was more vigorous than similar activity seen in December 2001, and it was accompanied by frequent loud noises. A visit to Kavachi on 25 November revealed sulfur, mud, and tiny pieces of volcanic rock upwelling from the submarine volcano. The pieces of volcanic rock covered the sea surface over an area more than 100 m across. No explosive eruptions were seen during a 6 hour observation period. As of 1 November no eruptive activity had been observed at Kavachi for about 5 weeks. Kavachi was watched from the coast of Gatokae Island, at a post about 26 km from the volcano. Low-level activity may well have occurred that was not visible from this observation post. Kavachi erupted daily during August through mid-September. During August ash and volcanic projectiles were observed rising 400 m above sea level and the glow from the volcano was visible from the coast of Gatokae Island, 32 km away. "Captain John Seaton of Solomon Islands Airways reported that submarine volcano Kavachi . . . was sighted erupting pm 28 October. Brown pumice spread on sea for 70 miles; 0.5-second eruption cycle. No lava build-up above sea level." Information Contacts: R.B.M. Thompson, Geological Survey, Honiara, Solomon Islands. The following is from Solomon Islands Airways. Kavachi activity first observed 28 October [at] 0400 GMT from distance with water eruptions only being observed. Able to observe more closely [on the] 29th when shock waves followed by water eruption were observed at roughly 30-second intervals. Further observations [on the] 31st showed activity continuing, but by 0100 GMT explosions and massive bubbles had ceased but boiling action of sea water still very persistent. Surface of sea for radius of 70 nautical miles streaked with red/brown matter which could be pumice. Other dye-type discoloration evident in patches up to 20 miles radius. The following is from the Geophysical Observatory in Port Moresby. From Stade Captain Fiji Airways flight on arrival Port Moresby [3 November at 0045 GMT]: "[2 November at 2101 GMT] Kavachi erupting grey mud from under sea to maximum height of 20 feet at 2-minute intervals. Sea light-green for a radius of 200 yards." The following cable from R. Thompson was received on 6 November. "Kavachi activity declining. Water eruptions (are) irregular, 30-minute intervals. Water shoot contains fragments black lava lifted from floor. Quiescent phase gentle upwelling 20 feet circumference. White subterranean flash observed before all upwellings. No steam except after water eruption. No pumice; yellow scum." The following cable from Captain Ivanoff was received on 10 November. "Submarine volcano Kavachi observed [on] 4 November by Captain Betts as follows: Core of activity 50 yards across active every four minutes discharging water ten feet rock and gas and a little mud. One geyser 200 feet sighted during total 30-minute observation. Area approximately three miles diameter colored light brown. Observation by Captain Ivanoff flight 7 November: Similar to previous sighting but eruption every 4.5-5 minutes every third eruption up to 50 feet water discoloration five miles diameter. Eight photos taken in 24-minute observation." The following was received from Solomon Islands Airways. The average size of eruptions (mainly water and steam) is not more than one hundred feet, but on one occasion, 3 November, I was able to observe what I considered a massive eruption of water and steam which extended vertically for well over 200 feet and possibly as high as 500 feet. The base of the column of water would have been at least 500 feet in diameter. The water in this area has always been discolored from time to time as slight activity continued, but on this occasion, i.e. over the last two weeks, the strength of the discoloration has increased greatly and can be seen clearly from 25 miles distance at 2,000 feet [altitude]. At the beginning of observations there was a high content of muddy-looking rubbish emerging from the center of the turbulent area but as the days went by this tended to clear itself and more steam began to replace it. Similarly, the amount of red water observed on the surface as far away as the Russell Islands had tended to dissipate with only faint streaks being observed over the last few days. Generally the activity is much cleaner-looking than it was two weeks ago, although I would suspect that the total activity has not waned very much. The eruption cycle on 7 November was about every minute on the average. 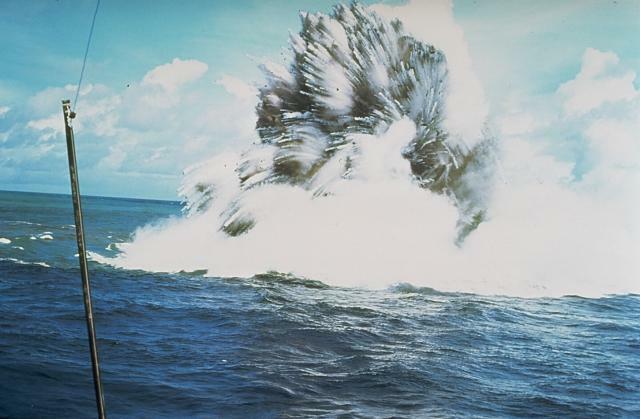 An interesting point is the shock wave effect seen in the water just prior to an eruption - a circular shock similar to that from a naval depth charge can be seen quite clearly and some few seconds later the column or irregular mass of water would appear, linger, and then slowly subside into the sea. The following cable was received on 20 November from R. Thompson. "Kavachi submarine volcano activity (has) waned to minor sea upwelling with discoloration. No water fountains observed since 11 November." Table 1. Summary of Kavachi activity observations, 28 October-10 November 1969. The ocean water color was "lime green" on all days after 28 October. Figure 1. Sketch map showing location of Kavachi and zone of water discoloration, October-November 1969. Information Contacts: Card 0813 (03 November 1969)Captain John Seaton, Solomon Islands Airways, Honiara; D. Denham, Geophysical Observatory, Port Moresby, Papua New Guinea. Card 0821 (12 November 1969)R.B.M Thompson, Geological Survey of the Solomon Islands, Honiara; Captain Ivanoff, Ansett Airlines, LAE, New Guinea. Card 0828 (20 November 1969)Captain John Seaton, Solomon Islands Airways, Honiara; R.B.M Thompson, Geological Survey of the Solomon Islands, Honiara. "The volcano was observed to be welling up very gently on 5 December and from then until the week before Christmas it was generally quiet. On the 22nd to the 24th of December the activity had renewed and water spouts were rising to 100 feet every five to ten minutes. It appears that this type of activity can be expected for some time." Information Contacts: R.B.M Thompson, Geological Survey of the Solomon Islands, Honiara. The following was received via cable on 31 Janaury. "Kavachi activity renewed. Cone 50 feet above sea with incandescent crest ash cloud glowing base 1,000 feet with rocks flying to 100 feet steam generated around base eruption minute intervals. First report watch (on ship) Fortune Glory 0800 GMT [30 January] confirmed aerially by TAA plane 2200 GMT [30 January]." Kavachi eruptions ceased between 0400 GMT on 6 February and 2200 GMT on 7 February. R. Thompson visited the island on 6 February at which time he observed a semi-circular island with a peak 30-35 feet above the surface and a rust-colored volcanic pipe six feet in diameter visible to the NW end of the island. The solid lava material was very rough with uneven blocks of lava that had flat sides. At 0300 GMT on 14 February [R. Citron] overflew Kavachi Island NE to the SW at an altitude of 150-200 feet. Observed a rock island protruding about 20-25 feet above the surface with breakers crashing on the island from the SW. The rocks were black in color. There was a brown and green discoloration on the water's surface that traveled in a direction SW from the island. The island had a surface area of approximately 500 square feet and appeared to be breaking down from severe wave action. Three cyclones were near the area and the sea was extremely rough. The diameter of the discolored area around the island was estimated at 200 feet traveling several thousand feet downstream toward the SW. Visited Kavachi volcano between 2200 and 2300 hours GMT on 16 February. Island was submarine with large breakers breaking on its submerged southwest flank. Brown discoloration over vent. Green yellowish discoloration trailing 1,000-1,500 feet toward SW. Attempt to obtain lava samples negative due to dangerously rough seas. William Proctor managed to obtain lava samples from Kavachi on 3 March (reported by R. Thompson). He estimated the depth of the summit at nine feet and its position at 157°59'E, 09°00'S, which is not quite the position marked on the marine chart. Summary of events at Kavachi from 28 October through 3 March 1970. All times are UTC. 0400 on 28 October 1969: Water eruptions were observed from a distance of about 15 miles from a Solomon Islands Airways plane. 2200 on 28 October 1969: The sea was discolored a yellowish green and reddish brown material observed to be floating on it. This material extended almost as far as the Russell Islands. Water eruptions occurred about every 30 seconds and rose to heights of up to 100 feet. The water in the eruptions was saturated with black rocks, pebbles, sand and mud. After the eruptions the mud fraction discolored the sea; a circular green muddy sea centered around the vent about 200-300 yards in diameter. 2200 on 29 October 1969: Similar activity no close observation. 0130 on 30 October 1969: Similar activity water eruptions probably 20-50 feet. 0130 on 31 October 1969: Activity waned to boiling action. 2700 on 2 November 1969: Two minute eruption cycle, eruption to 20 feet. 0130 on 3 November 1969: Massive water eruption up to 200 feet: possibly 500 feet approaching the vent from three miles away. 0300-0330 on 4 November 1969: Two small water fount eruptions up to 25 feet high observed from five mile to eight miles away which occurred with a two minute interval. Water fountain eruption at 0330 rose to about 60 feet. Flashes of light seen but these were not followed by eruptions. 0120 on 7 November 1969: 30-50 feet water fountains frequency 3 minutes. 0125 on 11 November 1969: No eruptions observed over 10 minutes from five miles. 0125 on 17 November 1969 through 19 November 1969: No eruptions observed on these days but a close look revealed discoloration of water and minor boiling type upwelling. 5 December 1969: Gentle upwelling. 14-20 December: A close look suggested all activity had ceased. 22 December 1969: Renewed steam and water eruptions up to 100 feet every five to ten minutes. 0130 on 16 January 1970: One steam eruption up to 100 feet. 0700 on 30 January 1970: Cargo vessel "Fortune Glory" reported a full volcanic eruption. Black smoke with glowing rocks coming out of vent at the top. The nearest observation was made from about five miles. 2300 on 30 January 1970: Plane circled the erupting vent and confirmed the first report. 2300 on 1 February 1970: Eruption observed. 0130 on 2 February 1970: Eruption observed. 0130 on 6 February 1970: Eruption observed to be continuing. 2200 on 7 February 1970: Close examination made. Eruption had ceased leaving a pyramid of black rock about 20 feet high. The heat of the rock shown by the spray breaking over the rock being converted to steam. The surviving rock above sea level appeared to be fairly massive but the southern flank had a coppled appearance. On the northeastern side of the cone these appeared to be remnants of a vent about five feet in diameter. The inner walls of the vent were coated with ochre, yellow and brown material. 0300 on 14 February 1970: Remnant cone observed about twenty feet above surface. 2200 on 16 February 1970: All rock above sea level gone but rock was observed about three meters below sea level. 3 March 1970: Small fragments of rock obtained by dredging. No loose rock found and rocks obtained were broken off from head of sunken cone by a heavy dredge. Depth of rock about three meters. Card 0901 (01 April 1970)R.B.M Thompson, Geological Survey of the Solomon Islands, Honiara; Robert A. Citron, Smithsonian Institution. Card 0921 (28 April 1970)R.B. Thompson, Geological Survey of the Solomon Islands, Honiara. A new eruption of Kavachi volcano was sighted on 24 August at 0800 by Solair pilot Bruce Kirkwood. A fountain of water and volcanic ejecta reached 30 m height. The eruption was continuing as of 2 September. Seismicity was being monitored by Deni Tuni at Vakambo, 45 km north of the volcano. The last eruption of Kavachi ended in February 1970. Information Contacts: R. Thompson, Geological Survey, Honiara. Much of the following information was received by R.B.M. Thompson from Solair pilots Bruce Kirkwood, Robert Snape, and Eric Cooper. Fountains of water and rock continued at least through 4 September, reaching about 60 m height. No information is available for 5 September. 6 September. A resident of Gatukai Island (NE of Kavachi) noted a change of the eruption column from white steam and spray to "smoke" during the afternoon (figure 2). Figure 2. Airphoto of Kavachi, taken 6 September 1976 (airplane wing at left of photo). Courtesy of R.B.M. Thompson. 7 September. A morning overflight revealed that a rubble pile had reached the surface. Heavy swells were breaking over the rubble, which continuously emitted steam and "smoke", accompanied by bursts of rocks. The maximum height reached by the ejecta was about 90 m. By 1600, a cone, extruding lava, extended 1.5-3 m above the surface. 8 September. At 1300 the cone was about 9 m above sea level and 40 m across (at sea level). A red glow from the cone's central vent was clearly visible in bright sunlight. Lava was pouring over the NW rim, which was about 3 m lower than the rest of the cone. Eruptions of blocks, reaching more than 150 m height, occurred at approximately 1-minute intervals. Some of the blocks were fairly large and some were glowing. Brown and white "smoke" was emitted continuously. 9 September. At 1030 the volcano was less active than the day before. Lava surged up and down, overspilling the NW rim into the sea on the larger upsurges. Eruptions of blocks, ash, and vapor, occurring every 1-2 minutes, were less intense than on the 8th. The island appeared to be breaking up, most rapidly on the NW, the prevailing wave direction. The maximum height of the cone above sea level was about 6 m. The surrounding water was discolored by a brownish scum. Photographs were taken by seismological observer Deni Tuni (figure 3). Figure 3. Airphoto of Kavachi, taken 9 September 1976 by Deni Tuni. View is from the E. Note the bombs being emitted from the vent. Courtesy of R.B.M. Thompson. The lava flow, which began on 7 September when the cone first built itself above sea level, ceased between 9 and 11 September. Pyroclastic eruptions continued, with small bursts every 30 seconds and larger ones every 2 minutes. "Smoke" emission was continuous. Tephra deposition had filled the breach in the SE wall of the crater by 15 September. Photographs taken on that date show an elongate island (NW-SE) about 100 m in length. Pyroclastic activity lasted until at least 1 October, maintaining its 30-second and 2-minute periodicity. No pumice was reported. Cone height stabilized at 15-20 m, with accretion of tephra compensating for erosion by the sea. An observer 24 km away noted no activity on 6 October. A survey to determine the size and position of the new cone was planned for 12 October. A temporary seismological station installed on Vakambo Island (8.37°S, 157.85°E, near New Georgia Island 73 km from Kavachi) began recording on 24 September. Twenty earthquakes were recorded 24 September-5 October, all with S-P separations corresponding to Kavachi epicenters, but they cannot be conclusively associated with the eruption since they were not recorded by another station. The station was operated by Deni Tuni. Captain Stewart Evans approached Kavachi at 1500 on 13 October observing subsurface activity, but no island. He reports: "There was a definite eruption cycle during the first 2 hours of observation. Eruptions were fairly regular at approximately 15-minute intervals, and every 4th or 5th eruption was of noticeably greater magnitude. The cycle broke down about 1730. Frequent tremors were then heard and felt from the government survey vessel Wakio, stationed about 1 km from the vent. The tremors were felt at 5-10 minute intervals, but eruptions became less frequent and less violent. No eruptions were sighted for a 40-minute period while steaming away from the area at about 1800. "The crest of the volcano was estimated to be less than 15 m below the surface and the sea was stained brown over an area approximately l00 m in diameter. The average height attained by ejecta (water and volcanic debris) was 10-15 m above the sea surface. The maximum height attained following the highest ejection was estimated at 30 m. Small waves were generated by each eruption. The average wave was 1 m high and radiated to about 500 m from the volcano. No bottom was found in a 365-m range on the echo sounder around a 1-km perimeter of the volcano." "On 23 October, I observed a circular area of shallow (yellow-blue) sea surrounding a deep (dark blue) area, from an airplane above Kavachi. A yellow-blue area looking like a reef extended to the SE." A study of 8 mm movies taken 9, 14, and 30 September, 1976 shows that red-hot blocks reached a maximum dimension of more than 1 m.
No other activity was reported until 0945 on 22 February, 1977 when Solair Chief Pilot Bruce Kirkwood reported plumes of spray and rock debris thrown upwards to about 60 m at intervals of 10 minutes. Renewed activity was first observed on 19 July at 1000 by Solair Pilot Bruce Kirkwood, 3 days after the previous overflight. Eruptions were seen on 20 July, and at about 30-second intervals on 22 July. Ash was ejected by the vent, which remained below the ocean surface. On 21 June, Bruce Kirkwood observed an eruption at Kavachi. Geologists from the Solomon Islands Ministry of Natural Resources flew over the site the next day and observed a circular island 30-50 m in diameter and 1-2 m in height (figure 4). Occasional weak explosions ejected ash and scoria, and the perimeter of the island was steaming. Figure 4. Airphoto taken 22 June 1978 showing the island formed by Kavachi's eruption. Courtesy of Frank Coulson. Kirkwood flew over the volcano again on 14 July and reported a N-S elongate island with a central cone estimated to be 30 m high. Bombs and blocks were thrown from the central vent to as much as 400 m altitude, and lava poured down the S flank. A small subsidiary vent appeared to be forming near sea level on the E coast. By 16 July (Kirkwood's next overflight) the S half of the island, including the central vent, had dropped along an E-W fault with a scarp that formed the new S edge of the island. The subsided area appeared to be just below sea level and eruptive activity there continued. During the 10-minute overflight, 1 explosion was observed. Information Contacts: F. Coulson, Ministry of Natural Resources, Honiara. When observed on 28 July, the eruption had ended. A small rocky island, about 15 m long, 5 m wide and no more than 3 m high remained at the eruption site. The island was expected to be destroyed by wave action within a few days to a few weeks. Information Contacts: F. Coulson and D. Tuni, Ministry of Natural Resources, Honiara. 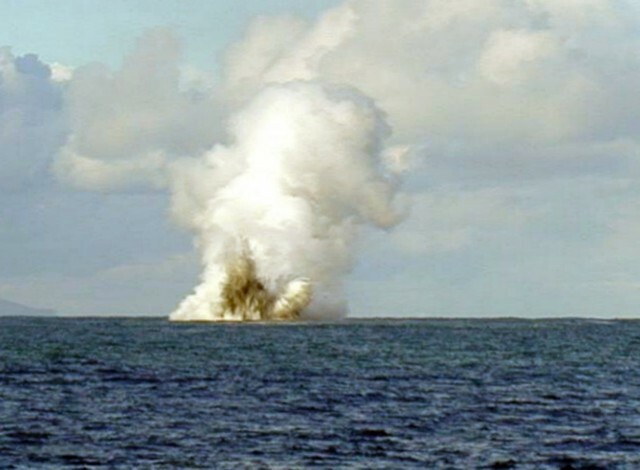 Bruce Kirkwood observed a small submarine eruption on 7 October. A mixture of water, steam, and blocks rose intermittently to more than 100 m above the ocean surface. Sea water surrounding the eruption site was slightly discolored. Information Contacts: D. Tuni, Ministry of Natural Resources, Honiara; B. Kirkwood, Solair. 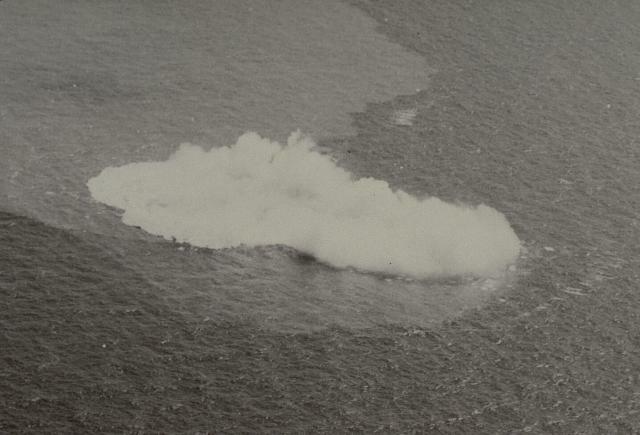 Solair pilots flying over Kavachi on 14 October observed a submarine eruption similar to that reported by Kirkwood on 7 October, although there appeared to be more mud in the surrounding seas. By 23 October, activity had decreased to occasional bursts of hot water at the surface. On 11 November at 1215 a Solair flight diverged from its normal route to observe the volcano. Drs. Hughes and Dunkley of the Geological Division, Ministry of Natural Resources, reported that a dense, nearly vertical steam jet was billowing to approximately 300 m, but dissipated as the plane approached. The eruption site was marked by white water, and a stream of muddy, turbid, pale brown water extending several km NE from the volcano. On 3 December Dunkley observed an area of discolored water several hundred meters wide extending NW (down current) about 4 km. No eruption was in progress. Solair pilots who overflew Kavachi in mid-September reported gas bubbling and discolored sea water. No eruption columns were observed. Further Reference. Johnson, R.W., and Tuni, D., 1986?, Kavachi, an active forearc volcano in the western Solomon Islands: reported eruptions between 1950 and 1982, in Taylor, B., and Exon N.F., (eds. ), Seafloor spreading ridge, subduction, volcanism, and sedimentation offshore. On the morning of 30 December, Solair Captain Brian Smith observed dirty water over Kavachi while flying from Honiara to Munda. 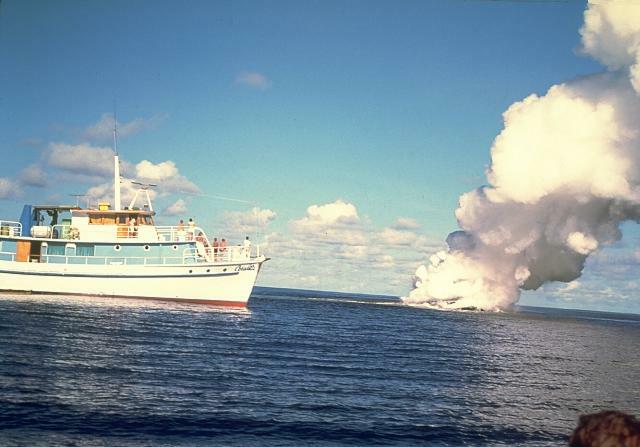 When he returned to Honiara that afternoon, Kavachi was ejecting rock debris, mud, steam, and water to a height of 30 m. The eruption was observed by the captain and crew of the MV Iu Mi Nao the same afternoon. On 31 December, the eruption was intensifying, with one explosion per minute ejecting material to 200-300 m height. By 1 January, both eruptive intensity and height of the ejecta column had decreased. On 7 January, Deni Tuni observed explosions while en route to Honiara on the MR Compass Rose II. Two explosions ejected black plumes that probably contained ash to about 20 m height. A third explosion, which appeared to consist mainly of steam and perhaps other gases, spread along the horizon, forming a pyramid-shaped cloud before disappearing. As of mid-January, no island had formed. The submarine eruption . . . described in 10:12 had been observed by residents of a nearby island in early December and was continuing in late February, but had ended by 3 March. From Saira village, roughly 25 km from Kavachi on Vangunu Island, Oliver Jino reported that the eruption sequence began on 9 December. After the previously reported observations from aircraft and ships 30 December-7 January, the next sighting was on 20 January, when Dr. G. Baines noted three ejections of water and steam, 1.5-2 minutes apart, from a Solair plane flying >45 km from the volcano. An area that looked like a coral reef but was probably volcanic debris extended downcurrent from the vent. On 24 January, Mr. B. Papukera, another Solair passenger, observed a single similar ejection. No activity was evident from a Solair plane on 5 February. On 25 February, Solair Captain Don Lemon observed renewed activity ejecting water and steam to 100 m or more asl. Two days later, Lemon again flew near the volcano, observing gas bubbles over the vent and muddy-looking water drifting away from it, but no explosions. On 3 March, personnel in a powered dinghy from the RV Thomas Washington searched the area but found no sign of activity. Eruptive activity . . . was reported on 5, 16, and 21 July. On 5 July at 1000, Solair Captain Brian Smith observed jets of water and volcanic debris being ejected to 60-90 m, forming a cone. In the center of the cone, incandescent magma could be seen. Two days later, Pilot Bill Watts reported discolored water and bubbles, but no explosions. On 8 July Pilot Tas Laurie observed steam and discolored water. A week later, on 21 July, ejection of water and steam to 60-90 m was again reported, lasting 2-3 minutes at a time, but not forming a cone. Activity continued for ~2 days, then subsided. Information Contacts: P. Dereni, Ministry of Natural Resources, Honiara. A newly emergent volcanic island near previously active Kavachi was observed ejecting lava and ash during a helicopter overflight on 4 May. John Starcy (Australian High Commissioner, Honiara, Solomon Islands) reported that "the volcanic action had already formed a thick rim of black material above sea level, inside which a large body of molten lava was churning and spewing out rocks." At the time, the island was estimated to be ~300x150 m in diameter and ~30 m high, with a lava pond ~50 m in diameter. Red Marsden (a Rabaul-based pilot) flew over the volcano on 12 May. The island had a regular conical shape that he estimated was ~15-20 m high. The volcano continued to eject incandescent lava fragments and some dark material to ~50 m height. White vapor emission occurred between ejections, and considerable steam rose from along the water line. Activity continued as of 13 May and the size of the cone continued to increase. The location of the new island remains uncertain (figure 5) [but more precise navigation linked it to Kavachi; see 16:7]. It was reported at 8.88°S, 157.88°E, 20 km NW of Kavachi, by Starcy, and ~38 km SW of Kavachi (at 9.23°S, 157.70°E; within the Woodlark Basin) by Ted Tame (Rabaul representative of the Papua New Guinea National Disaster and Emergency Services). A submarine volcano was shown on Admiralty Chart 3995 at ~25 km W of Kavachi (at 9.0°S, 157.8°E), between the two reported positions, but the Machias 1981 bathymetry survey failed to find this feature (Exon and Johnson, 1986). Instead, the survey located a bathymetric high 10 km to the WNW that is probably a southward-trending ridge originating on Tetepare Island. Figure 5. Map of the western Solomon Islands. Crosses represent reported new island locations, triangles mark the New Georgia Group volcanoes (Pliocene to Recent), and the filled circle represents the unnamed submarine volcano on Admiralty Chart 3995. Modified from Exon and Johnson (1986). Reference. Exon, N.E., and Johnson, R.W., 1986, The elusive Cook volcano and other submarine forearc volcanoes in the Solomon Islands: BMR Journal of Australian Geology & Geophysics, v. 10, p. 77-83. Information Contacts: G. Wheller, CSIRO, Australia; C. McKee, RVO. Pilots from Solomon Islands Airways reported that "the volcano is still active and increasing in size, though slowly" as of 14 June. Photographs taken on 12 May (by Rod Marsland, a Rabaul-based pilot) show the island to have been ~110 m in diameter, with a 15-m-diameter crater (assuming a height of 25 m based on an average of several visual estimates). Lava was being ejected to 30 m height in the photos. The new island's exact location remains uncertain. Information Contacts: P. de Saint-Ours, RVO. 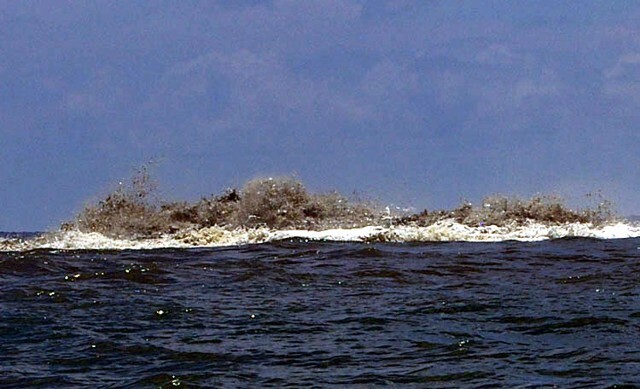 An eruption built a small temporary island . . . first observed on 4 May, but its location was initially uncertain. However, more precise navigational data from the chief pilot of Western Pacific Air Services placed the activity at 9.00°S, 157.97°E, roughly 3 km NE of Kavachi's summit. 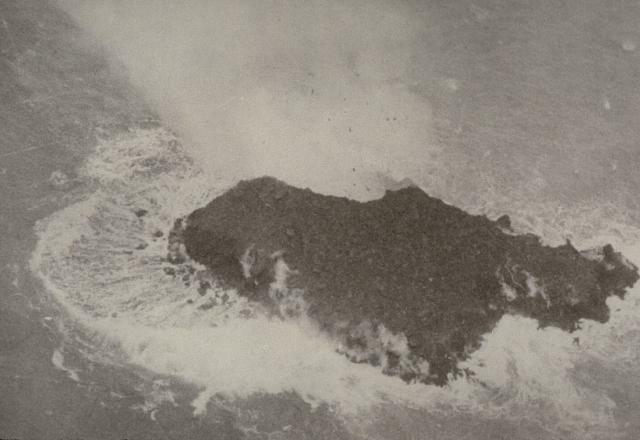 Activity apparently had not changed when, during an overflight on 5 June, [John] Monroe observed a vigorously active lava fountain roughly 25 m high and a plume that rose >2,500 m. The island's dimensions were estimated at 150-200 m long and ~50 m high. Carl Rossiter reported that divers ~45 km NE of Kavachi (at Kicha Island) felt powerful explosions while underwater on 7-8 and 12-13 June. Individual explosions occurred a few seconds apart in groups of 12-20. Explosion groups generally lasted a total of 1-2 minutes, were typically preceded and followed by rumbling, and were separated by roughly 30 minutes of quiet. No explosions were felt at other dive sites, where islands were between the observers and Kavachi. The eruption weakened in mid-June, and the island disappeared beneath the ocean surface later in the month. No additional activity has been reported. Information Contacts: R. Addison and A. Papabatu, Ministry of Natural Resources, Honiara; J. Monroe, San Jose, USA; C. Rossiter, See and Sea Travel Service, San Francisco, USA. A bathymetric survey in the vicinity of Kavachi volcano was carried out on 11 August by the HMNZS Tui. The ship made three parallel transits, ~1,200 m apart, over the summit of the unnamed seamount ~7 km NW of Kavachi. The summit is mostly flat, with a depth of at least 130 m found on each pass. The transit farthest NE showed a shallow and a deep crater on the tracing of the 12 kHz echo sounder. The 44-kHz echo sounder showed two small plumes rising to mid-water depth on either side of the smaller crater. Near Kavachi itself, inflatable boats with hand-held echo sounders and portable GPS receivers were used to determine spot water-depths. A sulfur smell and a patch of milk-colored water 20 m in diameter were reported by boat crews near the shallowest (20 m) depth location (8.994°S, 157.973°E). Several other similar patches were observed within 150 m of this point, in water 20-30 m deep. Information Contacts: L. Hall, Defence Scientific Establishment, and Lt. Cdr. G. Craig, HMNZSTui, Auckland Naval Base, New Zealand. On 16 January a Solair pilot reported continuous ejection of mud and hot ash up to 2,100 m altitude. When the pilot returned on 17 January, the eruption was continuing with intermittent plumes reaching similar heights. On 29 January the sea water near the volcano was discolored and dirty, however, there were no reports of eruptive activity. Kavachi is a basaltic to andesitic shallow submarine volcano. It has produced ephemeral islands at least nine times since its first recorded eruption in 1939. The last record of eruptive activity was in May 1991 (see BGVN 16:07). Information Contacts: Alison K. Papabatu, Ministry of Energy, Water and Mineral Resources, Solomon Islands. On 14 May 2000 Australian research vessel Franklin visited Kavachi seamount to discover that . . . a new eruption was underway (figure 6). The vessel was supporting an Australian Commonwealth Scientific and Industrial Research Organization (CSIRO) research cruise (FR04/00) entitled Project SHAARC (Submarine Hydrothermally Active Arc Volcanoes). Upon arrival at 0600 hours observers saw waves breaking on the peak of the volcano. Every 5-7 minutes the scientists on the CSIRO vessel witnessed violent eruptions that lasted 2-3 minutes each, prevailing for the approximately 20 hours that they observed the volcano. The position of the eruption column was fixed specifically at 8.99°S, 157.97°E, and the volcano's peak was estimated at 2-5 m below the water surface. The eruptions ejected ash and incandescent blocks of lava up to 70 m above the sea surface and sulfurous steam plumes rose to heights of 500 m.
Figure 6. Photograph showing an eruption at Kavachi Seamount, 14 May 2000. Courtesy of CSIRO. The science team aboard Franklin documented the apparent new phase of island-building eruptive activity. A bathymetric map was produced that differed significantly from the previous map of the volcano made in 1984. Hydrocast/CTD (conductivity-temperature-depth) surveys were undertaken; these detected numerous chemical and particle plumes in the water column; the plumes extended at least 5 km from the eruptive center. Systematic sampling of rocks and ash from the flanks of the volcano returned glassy, vesicular basalts and hydrothermally altered sulfide-rich volcanic breccias. In addition, approximately 500 photographs and 2 hours of digital video captured ~20 eruptions during daylight. The scientific participants on the CSIRO-led cruise were: Brent McInnes, CSIRO Exploration & Mining Chief Scientist; Richard Arculus, Principal Investigator, and Cromwell Qopoto, Australian National University (ANU); Gary Massoth, Principal Investigator, and Cornel DeRonde, New Zealand Institute of Geological and Nuclear Sciences Ltd (IGNS); Ed Baker, National Oceanic and Atmospheric Administration (NOAA); Pamela Brodie, Dan Conwell, Tim MacConachy, and Ron Plaschke, CSIRO; John Chadwick, University of Florida; and Philip Pousai, University of Papua New Guinea. Information Contacts: Brent McInnes, Chieft Scientist (FRO4/00), Division of Exploration & Mining, Australian Commonwealth Scientific and Industrial Organization (CSIRO), PO Box 136, North Ryde, NSW 1670, Australia (URL: http://www.csiro.au/). Howell reported that activity waned in late September. As of 1 November no eruptive activity had been observed at Kavachi for about five weeks, but the observation post sat at the coast of Gatokae (also written Nggatokae) Island ~26 km NE of the volcano (see regional maps, CSLP Card 8028; BGVN 16:04). Low-level activity may have occurred that was not visible from the observation post. A visit on 25 November revealed upwelling sulfur, mud, and tiny pieces of volcanic rock. The pieces of rock covered the sea surface over an area ~200 m across. A brownish green stain clouded the seawater. No explosive eruptions were seen during 6 hours of observation. Howell further noted that on 27 November Kavachi resumed explosive activity with columns reaching ~2 km high. Reference. Johnson, W., and Tuni, D., Kavachi, 1987, An active forearc volcano in the western Solomon Islands: reported eruptions between 1950 and 1982, in Taylor, B., and Exon, N.F. (eds. ), Marine geology, geophysics, and geochemistry of the Woodlark Basin, Solomon Islands: Circum-Pacific Council Energy Min Resour Earth Sci Ser, v. 7, p. 89-112. Information Contacts: Corey Howell, The Wilderness Lodge, PO Box 206, Honiara, Solomon Islands (URL: http://www.thewildernesslodge.org). This report covers activity at Kavachi submarine volcano since the eruptions in August to mid-September 2001 and on 27 November 2001 (BGVN 26:11). It includes information from Corey Howell of The Wilderness Lodge on the island of Gatokae (Nggatokae), ~ 35 km NE of Kavachi, and a research cruise of the Commonwealth Scientific and Industrial Research Organization (CSIRO) (McConachy and others, 2002). 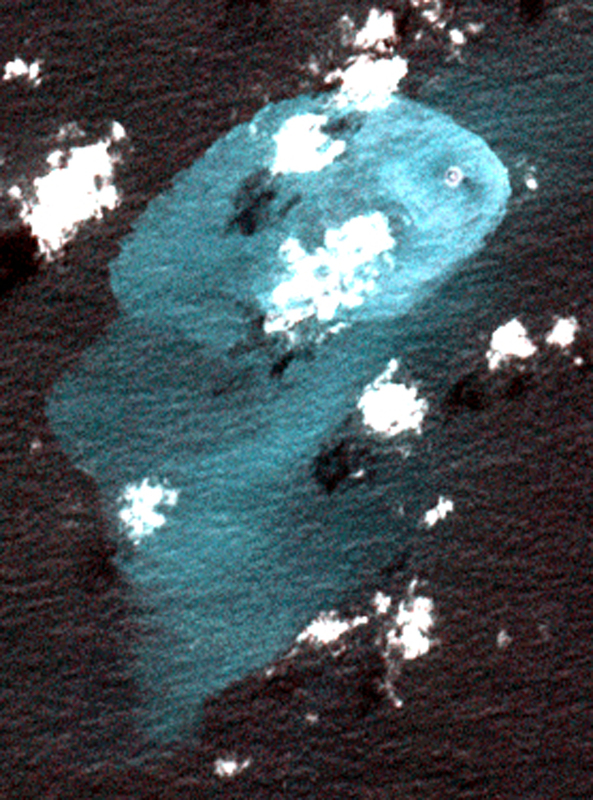 On his visit to the site of the volcano on 25 November 2001, Howell described a colored stain in the seawater. His photo of the setting portrays a calm sea surface without visible agitation and very little froth floating on the surface; the stain rose from depth. Elsewhere on his website he commented about trolling and catching fish within upwelled material on this date: "Trolling around the vent at Kavachi delivered the goods once again with 23 large rainbow runner, two Spaniards, [bara]cuda, and bigeye trevally-112 kilos [kg] of fish, which fed the entire village. We dropped two very large Spaniards, both taking the lure right in the middle of the vent upwelling, and saw countless sharks, runner, trevally, and yellowfin." Howell noted that explosive eruptions occurred daily during 27 November-13 December 2001. Strong monsoon winds prevented visits then. In discussing regional weather patterns he noted that the prevailing monsoon westerly winds common at Kavachi from December to March reach 15-18 knots, increasing to 25-30 knots during torrential rain squalls. Conditions become choppy with seas 1-2 m with an underlying 2-3 m SW groundswell. Seas such as these could influence erosion at Kavachi. Howell visited Kavachi again on 14 and 28 January 2002, and he passed some 15 km from Kavachi on 17 January 2002. In his summary of those observations and visits, written on 30 January 2002, Howell noted that he had measured the summit's current depth at 60 m. He saw a continuous stream of sulfur, small fragments of volcanic rock, and gases escape, resulting in a vigorous dirty-yellow to light-brown upwelling at the surface. Columns of bubbles rose to the surface and slicks of sulfur prevailed down-current, forming an extensive plume of discolored water several kilometers in length. Occasional explosive eruptions produced columns composed of and occasionally ash, rock, and water, rising to a height of ~ 1 km and visible for at least 40 km. He went on to say that the vent had emitted a range of loud sonic cracks and booms at intervals of 2-15 minutes. These sounds were loud and clear to witnesses standing in the boat but were heard best in the water, leading to "a sensation that can only be described as being shot point-blank with a high-powered rifle sans pain." Below 10 m water depth divers heard a continual barrage of different sounds coming from the vent. Several powerful earthquakes were felt on nearby Gatokae Island during this observation period (November 2001-January 2002); however, the large regional earthquake that struck Port Vila, Vanuatu, was not felt on the island. When Howell visited Kavachi on 14 January he noted a slick of unidentified materials coming from the vent column. On 28 January he saw extensive trails of yellow sulfur extending down current. CSIRO conducted two echo-sounding bathymetric surveys of Kavachi a bit over 22 months apart, enabling morphologic comparisons. The earlier survey took place on 14 May 2000 (research cruise FR04/00, Project SHAARC; McInnes and others, 2000) (see BGVN 25:04). The later survey occurred on 28 March 2002 (research cruise FR03/2002, Project SOLAVENTS 2002; McConachy and others, 2002). Comparing the 2000 to the 2002 bathymetry (figure 7 (top and bottom)) showed that Kavachi had changed, in places significantly. In 2002 the summit had dropped to clearly well below sea level, compared with 3 m below in 2000. Some lower parts of the volcano appeared to be at lesser depths, perhaps due to mass wasting carrying material downslope and depositing it there. The CSIRO 2002 cruise kept some distance from the summit area, and the shallowest point surveyed was just E of the summit at 85 m depth. Neither of the cruises crossed over the apex of the Kavachi summit. Figure 7. Bathymetric maps of Kavachi made by the CSIRO Project SHAARC cruise on 14 May 2000 (left) and the CSIRO Project SOLAVENTS cruise on 28 March 2002 (right). For both maps the fine lines represent ship's tracks during echo soundings. Contour intervals on the SHAARC map are 100 m, for the SOLAVENTS map, 50 m. The SOLAVENTS map shows locations of hydrocast samples (SLH) and bottom grab samples (SLG). Courtesy of Tim McConachy, CSIRO. During the CSIRO 2002 cruise an unusual rise in the surface seawater temperature was recorded NW of the summit area and scum resembling oil slicks was noted on the surface in places. Methane analyses of water collected through hydrocasts (a technique where sample bottles are lowered by a cable) suggest hydrothermal sources on the flanks of Kavachi. A bottom grab sample taken at 95 m depth just E of the summit gave off a pungent hydrogen sulfide odor; the black volcanic sand recovered contained small specks (up to pea size) of yellow sulfur and traces of pyrite. A second grab sample, collected NW of the summit, contained gravel-size pieces of more altered, gray to cream colored rock as well as black volcanic sand and gravel. A third grab sample SW of the summit contained black volcanic sand and gravel, but no evidence of native sulfur or sulfide. About a fortnight after their 28 March 2002 visit, the crew received an email from Howell (dated 18 April 2002), in which he noted that observers on the weather coast of Gatokae (the island's SW side, which faces toward Kavachi) reported eruptions each day that week except Monday. The eruptions usually occurred only once or twice in a 24-hour period. Howell visited Kavachi again on 16 March 2002, finding the summit then at a depth of 34 m. He determined the summit's coordinates using a Garmin GPS (global positioning system) with a nominal accuracy of ~ 9 m. When this position was plotted on the map generated by the CSIRO 2002 cruise and contoured, Kavachi appeared quite conical in shape with a prominent SW ridge defined by the 350 m contour. Howell's work placed the new summit ~ 315 m E of its previous location (fixing it at 8°59.64'S, 157°58.409'E; whereas the 2000 SHAARC research cruise fixed it at 8°59.65'S, 157°58.23'E). According to Howell, during October to November 2002 Kavachi ultimately rose to form an island 10-15 m above sea level. In accord with this emergence from the sea, Wright and others (in press) noted four alerts in the MODIS-MODVOLC satellite thermal detection system during November 2002. Howell stated that subsequently the island eroded in late-season SE seas and swells. When visited on 16 November 2003, Howell found the summit at ~ 32 m below sea level, a significant change from the island seen three months earlier. In summary, table 2 shows discontinuous observations of elevation/depth of the summit of Kavachi over a period of about 3.5 years (2000-2003). Table 2. A compilation listing the stated elevations (+) and depths (-) of Kavachi's summit over a 3.5-year period. Courtesy of Tim McConachy (CSIRO) and Corey Howell (The Wilderness Lodge). References. McConachy, T.F., Yeats, C.J., Arculus, R.J., Beattie, R., Belford, S., Holden, J., Kim, J., MacDonald, L., Schardt, C., Sestak, S., Stevens, B., and Tolia, D. (edited by C.J. Yeats), 2002, SOLAVENTS-2002, Solomons Australia Vents Expedition aboard the RV Franklin, 26 March-21 April 2002: CSIRO Exploration and Mining Report 1026F, Final Cruise Report FR03-2002, 456 p.
Peterson, M.G., Wallace, S., and Tolia, D., 1999, Records of explosive Surseyan eruptions from Kavachi, Solomon Islands, in 1961, 1970, 1976, 1978, 1991, 1998, and 1999, Keith, A.W.C., and Rodda, P., eds. : Abstracts of Papers Presented at the STAR (Science, Technology and Resources) Network, SOPAC Miscellaneous Report 355, p. 53. McInnes, B.I.A., Arculus, R., Massoth, G., Baker, E., Chadwick, J., DeRonde, C., McConachy, T., Posai, P., and Qopoto, C., 2000, Project SHAARC, Investigation of submarine, hydrothermally active arc volcanoes in the Tabar-Lihir-Tanga-Feni Island and Solomon Island chains: CSIRO Exploration and Mining Open File Report 762F, 20 p.
Information Contacts: Timothy F. McConachy, CSIRO Division of Exploration and Mining, P.O. Box 136, North Ryde, NSW 1670, Australia; Corey Howell, The Wilderness Lodge, P.O. Box 206, Honiara, Solomon Islands (URL: http://www.thewildernesslodge.org/). The Solomon Islands' goverment-supported web service, the People First Network (PFnet) reported in March 2004 that Corey Howell of The Wilderness Lodge, Gatokae Island, observed Kavachi erupting (figure 8). Kavachi is among the world's few regularly erupting submarine volcanoes that sends material above the ocean surface in witnessed (and reported) eruptions. Figure 8. A photo of Kavachi erupting as seen on 15 March 2004. The original caption on PFnet was "Kavachi awoke on Monday in spectacular fashion after an eight-month slumber . . .." Courtesy of Corey Howell. The figure caption on PFnet notes an 8-month period of Kavachi inactivity, which was also confirmed in brief correspondence with Howell. A report that summarized the interval between the summer of 2001 and the end of 2003 (BGVN 29:01) lacked any mention of an eruption during mid-August 2003, eight months before the recent eruption. Information Contacts: Corey Howell, The Wilderness Lodge, P.O. Box 206, Homiara, Solomon Islands (URL: http://www.thewildernesslodge.org/); People First Network (PFnet), Rural Development Volunteers Association, Ministry of Provincial Government and Rural Development, PO Box 919, Honiara, Solomon Islands. A large earthquake (M 8.1) occurred in the Solomon Islands on 2 April 2007, centered about 126 km NW of Kavachi. Following the earthquake, Corey Howell of The Wilderness Lodge on Gatokae Island received several reports from residents on Gatokae and Vangunu Islands describing noises attributed to Kavachi (~ 35 km WSW of Gatokae). A confirmed report from Marila Timi of Biche Village (on the S coast of Gatokae) stated that around the time of the 2 April earthquake, Kavachi emitted an eruption column visible from her garden above the village. On 6 April Howell traveled to Kavachi to observe the volcano. Howell spent 2.5 hours on location within 200 m of the active vent, and dove down to within tens of meters of the vent. The volcano exhibited its usual vigorous upwelling, producing a plume of discolored mud- and sulfur-laden water several hundred meters wide and at least 3 km in length downcurrent (figure 9). He measured a temperature of 40°C in the subsurface plume, which appeared normal as compared with his previous 30 visits to Kavachi since 1999. The only explosive activity observed or felt was occasional thudding detonations and sea-surface percussions, with shockwaves producing spray and billows of ash-laden water (figures 10 and 11). Kavachi lacked a significant explosive eruption column or signs of ejected pyroclastic materials, behavior witnessed on many previous visits. On this visit, Howell found nothing out of the ordinary following the 2 April earthquake. Figure 9. Photograph showing a mud-and sulfur-laden plume downcurrent of Kavachi's upwelling vent on 6 April 2007, forming a discolored area several hundred meters wide and several kilometers long. Howell noted that such plumes are frequently seen at Kavachi. Courtesy of Roy Hall (posted on The Wilderness Lodge website). Figure 10. Some of the stronger activity observed at Kavachi on 6 April 2007 included very turbulent ash-laden water above the vent, explosive and percussive noises, and discolored water downcurrent of the vent. Courtesy of Roy Hall (posted on The Wilderness Lodge website). Figure 11. Some of the stronger activity observed above the vent at Kavachi on 6 April 2007 consisted of shockwaves producing dancing spray, accompanied by staccato bursts of sound. These noises also reverberated through the bottom of the boat. Courtesy of Roy Hall (posted on The Wilderness Lodge website). Information Contacts: Corey Howell, The Wilderness Lodge, Peava Village, Gatokae Island, Western Province, Solomon Islands (URL: http://thewildernesslodge.org/). The most recent previously observed eruption of Kavachi occurred during 2-6 April 2007 and consisted of vigorous upwelling, discolored water, and minor explosions (BGVN 32:02). 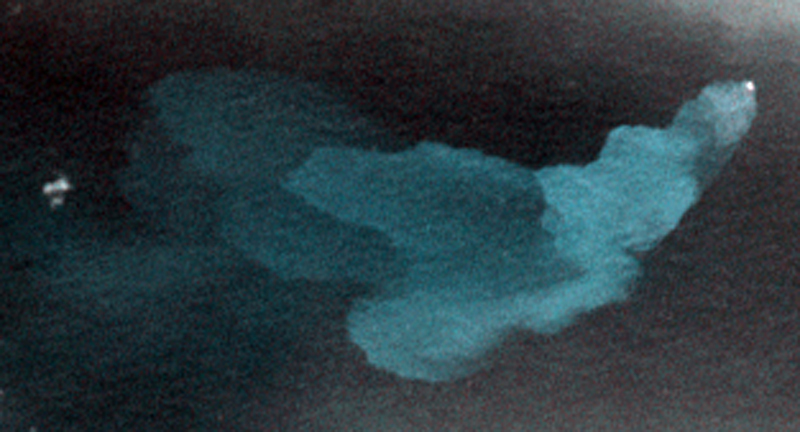 On 29 January 2014, the NASA Advanced Land Imager (ALI) on the Earth Observing-1 (EO-1) satellite imaged a plume of discolored water at least 5 km long streaming ESE from the submarine volcano (figure 12). The water plume, likely discolored due to dissolved volcanic gases and suspended tephra in the water, originated at the location of the volcano. Directly above the source of the discolored water, a bright patch suggests vigorously churning water, but there was no sign that an eruption had broken the ocean surface. Figure 12. Satellite image of discolored water flowing ESE from a possible eruption of Kavachi on 29 January 2014. Note the 500 m scale bar at lower left. Courtesy of NASA Earth Observatory; image by Jesse Allen and Robert Simmon, using EO-1 ALI data from the NASA EO-1 team. Caption by Robert Simmon. Information Contacts: NASA Earth Observatory (URL: http://earthobservatory.nasa.gov/NaturalHazards/view.php?id=83025); NASA EO-1 team (URL: http://eo1.gsfc.nasa.gov/). Named for a sea-god of the Gatokae and Vangunu peoples, Kavachi is one of the most active submarine volcanoes in the SW Pacific, located in the Solomon Islands south of Vangunu Island about 30 km N of the site of subduction of the Indo-Australian plate beneath the Pacific plate. Sometimes referred to as Rejo te Kvachi ("Kavachi's Oven"), this shallow submarine basaltic-to-andesitic volcano has produced ephemeral islands up to 1 km long many times since its first recorded eruption during 1939. Residents of the nearby islands of Vanguna and Nggatokae (Gatokae) reported "fire on the water" prior to 1939, a possible reference to earlier eruptions. The roughly conical edifice rises from water depths of 1.1-1.2 km on the north and greater depths to the SE. 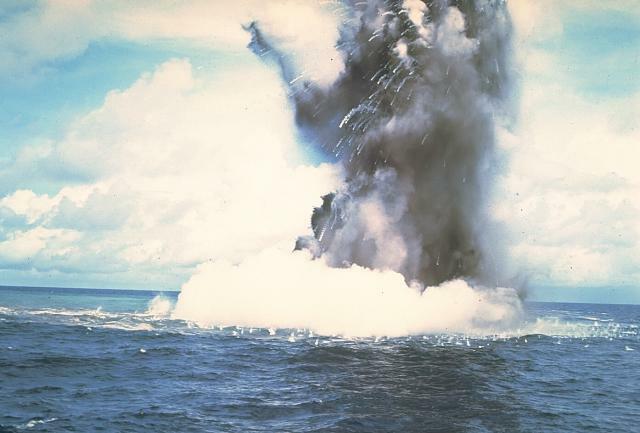 Frequent shallow submarine and occasional subaerial eruptions produce phreatomagmatic explosions that eject steam, ash, and incandescent bombs. On a number of occasions lava flows were observed on the ephemeral islands. Baker E T, Massoth G J, de Ronde C E J, Lupton J E, McInnes B I A, 2002. Observations and sampling of an ongoing subsurface eruption of Kavachi volcano, Solomon Islands, May 2000. Geology, 30: 975-978. Exon N F, Johnson R W, 1986. The elusive Cook volcano and other submarine forearc volcanoes in the Solomon Islands. Aust Bur Min Resour Geol Geophys J, 10: 77-83. Grover J C, 1968. Submarine volcanoes and oceanographic observations in the New Georgia Group, 1963-64. Brit Solomon Is Geol Rec, 1963-67 Rpt, 96: 116-125. Johnson R W, Tuni D, 1987. Kavachi, an active forearc volcano in the western Solomon Islands: reported eruptions between 1950 and 1982. In: Taylor B and Exon N F (eds) Marine Geology, Geophysics, and Geochemistry of the Woodlark Basin, Solomon Islands, Circum-Pacific Council Energy Min Resour Earth Sci Ser, 7: 89-112. Okrugin V M, 1985. Information note on the results of the 7th cruise of the R/V 'Vulcanolog' in the vicinity of the Solomon Islands. Solomon Is Geol Div File Rpt, unpublished rpt. Petterson M G, Wallace S, Tolia D, 2001. 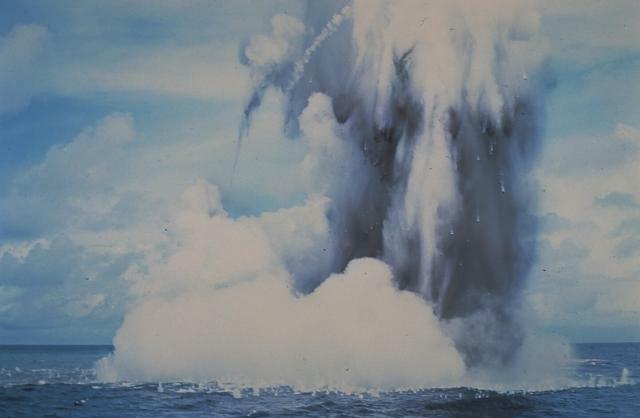 Explosive Surtseyan eruptions from Kavachi, Solomon Islands in 1961, 1970, 1976, 1991, 1998, and 1999. Unpublished manuscript, 8 p.
There is data available for 33 Holocene eruptive periods. There is no Deformation History data available for Kavachi. There is no Emissions History data available for Kavachi. A burst of incandescent magma rises above the sea surface at Kavachi volcano in the Solomon Islands. By the time of this June 30, 1978 photo, the vent of the submarine volcano had reached the sea surface. Dark blocks of extruded lava can be seen through the clouds of steam. No sign of the submarine volcano had been observed on June 20, but the following day an eruption was seen. By the 22nd, a 30-50 m wide island was observed, from which incandescent lava was emerging. Vapor and ash rose a few thousand meters into the air. Photo by W.G. Muller, 1978 (courtesy of Deni Tuni, Ministry of Lands, Energy and Mineral Resources, Solomon Islands). A spectacular shallow-water phreatomagmatic, or surtseyan eruption from Kavachi volcano is observed from a small boat on July 17 or 18, 1977. Sprays of dark ash can be seen emerging from white vapor clouds. Numerous individual blocks ejected at high velocity are trailed by clouds of steam. Similar activity was observed from boats and airplanes for a period of less than one week. Photo by W.G. Muller, 1977 (courtesy of Wally Johnson, Australia Bureau of Mineral Resources). 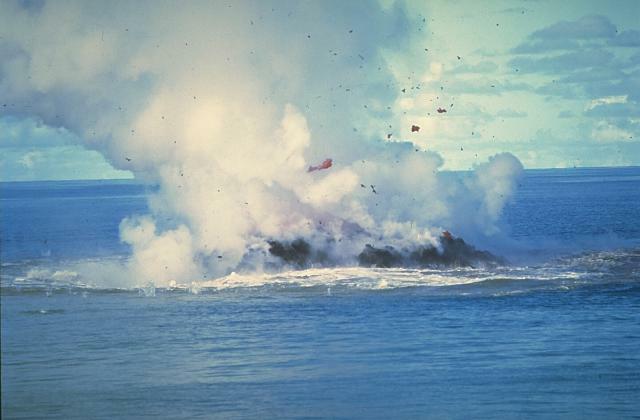 Submarine explosions from Kavachi volcano eject a column of water, steam, and ash above the sea surface in July 1977. Contrails of steam trail from large ejected blocks, which can also be seen impacting the sea surface in the foreground. Similar activity was observed over a period of less than a week. Photo by W.G. Muller, 1977 (courtesy of Deni Tuni, Ministry of Lands, Energy and Mineral Resources, Solomon Islands). 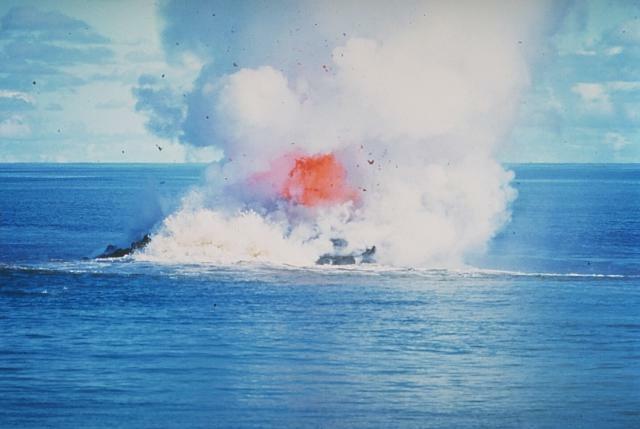 Submarine hydroexplosions took place at Kavachi October 28 to November 7, 1969. This photo on the opening day of the eruption shows steam clouds rising above an area of water discoloration. Renewed explosions began on December 22, and a new island was first seen on January 30. The last eruptions were observed on February 6, and the new island was destroyed by wave action between February 7 and 17. Photo by Chris Tabona, 1969. Sea waves break around a newly formed lava island at Kavachi on September 9, 1976. Submarine explosions ejected fountains of water and rock to about 60 m height on August 24. Similar activity was observed September 4-6. By the 7th, lava effusion was observed. Lava flows ceased between September 9 and 11, but explosions continued, and by the 15th the island was 100-m long. By October 6 the island had disappeared. Explosive eruptions were last observed on October 13 from a vent estimated to be less than 15-m below sea level. Photo by Deni Tuni, 1976 (Ministry of Lands, Energy and Mineral Resources, Solomon Islands). An ash-laden eruption column was ejected above the sea surface at Kavachi volcano on July 17 or 18, 1977. Additional explosions were seen July 19-22, with vapor and ash clouds reaching several hundred feet above the sea surface. 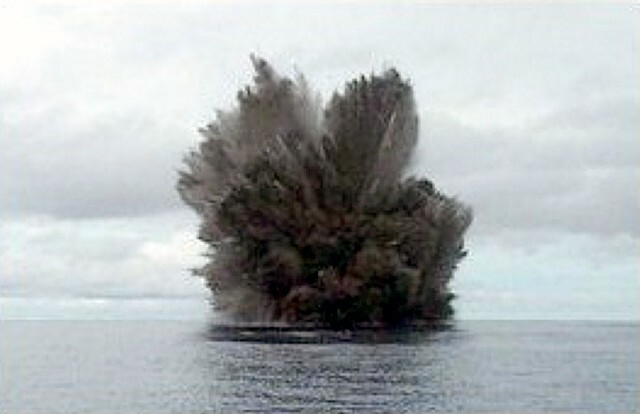 This activity is typical of submarine eruptions from Kavachi, one of the most active volcanoes of the Solomon Islands. At least eight new ephemeral islands have been formed since the first reported historical eruption in 1939. Passengers on small boats observe a submarine eruption from Kavachi volcano in July 1977. The isolated Kavachi, one of the most active submarine volcanoes in the SW Pacific, is located far from major aircraft and shipping lanes. Kavachi, sometimes referred to as Rejo te Kvachi ("Kavachi's oven"), has produced ephemeral islands up to 150-m long at least eight times since its first recorded eruption during 1939. The roughly conical volcano rises from water depths of 1.1-1.2 km on the north and greater depths to the south. Clots of incandescent magma rise above Kavachi on June 30, 1978 after the vent of the submarine volcano had reached the sea surface. No sign of the volcano had been noticed on June 20, but the following day an eruption was seen. On June 22 a 30-50 m island was observed from which incandescent lava was emerging. Vapor and ash rose a few thousand meters into the air. The eruption ended sometime between July 16 and 28 overflights, when the island was only about 15-m wide and 3-m high. An explosive eruption from Kavachi volcano was seen from the Australian CSIRO research vessel Franklin on May 14, 2000. During their 20 hours of observations, every 5-7 minutes the scientists on the CSIRO vessel witnessed violent eruptions that lasted 2-3 minutes each. The volcano's peak was estimated at 2-5 m below the water surface. The eruptions ejected ash and incandescent blocks of lava up to 70 m above the sea surface, and sulfurous steam plumes rose to heights of 500 m. Kavachi had been erupting intermittently since November 1999. Photo by Australian Commonwealth Scientific and Industrial Organization (CSIRO), 2000. An ash-laden cloud rises above Kavachi volcano on March 15, 2004. Projections of individual blocks, trailing steam and ash, can be seen at the margins of the cloud. The frequently erupting submarine volcano had been inactive since August 2003. Photo by Corey Howell, 2004. Some of the stronger activity observed at Kavachi on April 6, 2007 included very turbulent ash-laden water above the vent, explosive and percussive noises, and discolored water downcurrent of the vent. Following a major April 2, 2007 tectonic earthquake, Kavachi emitted an eruption column visible from Biche village (on the S coast of Gatokae Island). Photo by Roy Hall, 2007. The following 2 samples associated with this volcano can be found in the Smithsonian's NMNH Department of Mineral Sciences collections, and may be availble for research (contact the Rock and Ore Collections Manager). Catalog number links will open a window with more information. Large Eruptions of Kavachi Information about large Quaternary eruptions (VEI >= 4) is cataloged in the Large Magnitude Explosive Volcanic Eruptions (LaMEVE) database of the Volcano Global Risk Identification and Analysis Project (VOGRIPA).